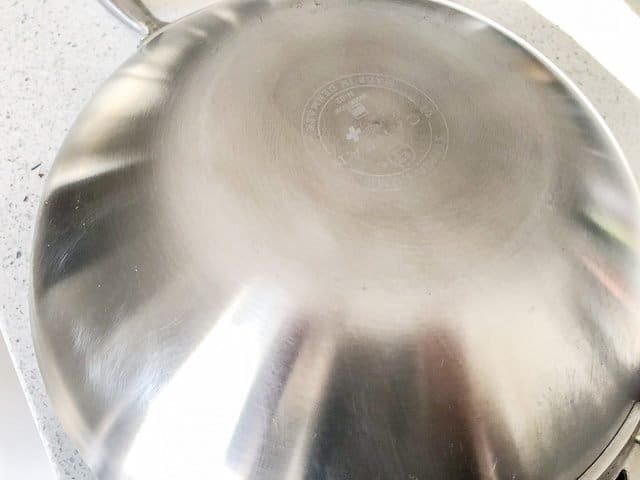 I have a long history with Scanpan. We owned and gave away a few sets of Scanpan cookware 9 years ago when I went on my book tour after publishing my first cookbook. Since then, we have switched cookware brands in our kitchen multiple times, and it was nice to get Scanpan back into our hands for this testing. 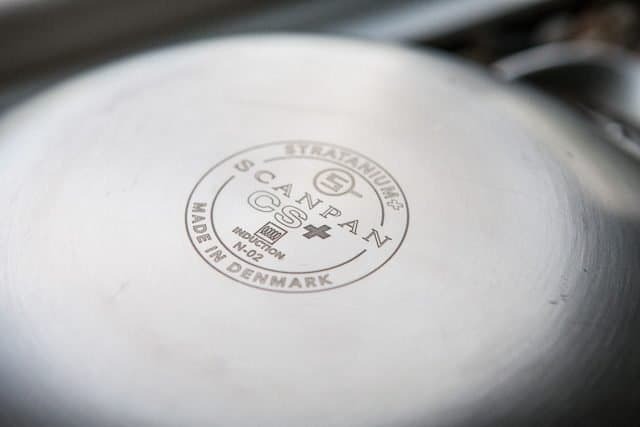 Scanpan is a family-owned business based in Ryomgaard, Denmark, specializing in PFOA-free nonstick cookware. 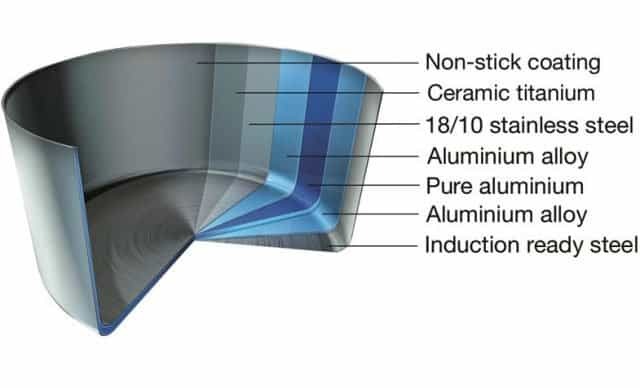 Their nonstick technology is called Stratanium, which consists of 5 layers of material. No oil needed for cooking. I love these elegant, curved handles. Easy to hold, ergonomic and strong. PRO: A helper handle is essential to any wok. That’s because stir-fry cooking involves ingredients coming in and out of the wok (more on this a little later). The helper handle allows you to easily lift and tilt the wok without strain on your other arm. The wok’s base must be flat if you don’t have a wok ring. Many home stovetops cannot support wok rings, especially those that require the wok ring to sit on TOP of the grates. This is because many burners are not strong enough to reach up to “hug” the bottom of the wok. 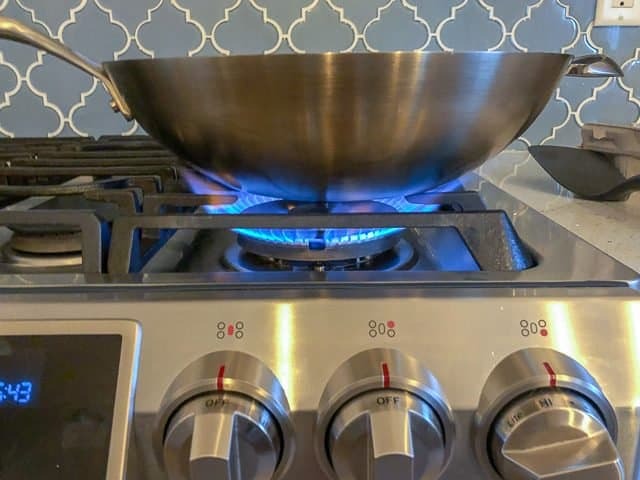 My Samsung gas range has one burner with 18,000 BTUs. It’s pretty dang strong, but even with that power, I have a hard time with wok rings. 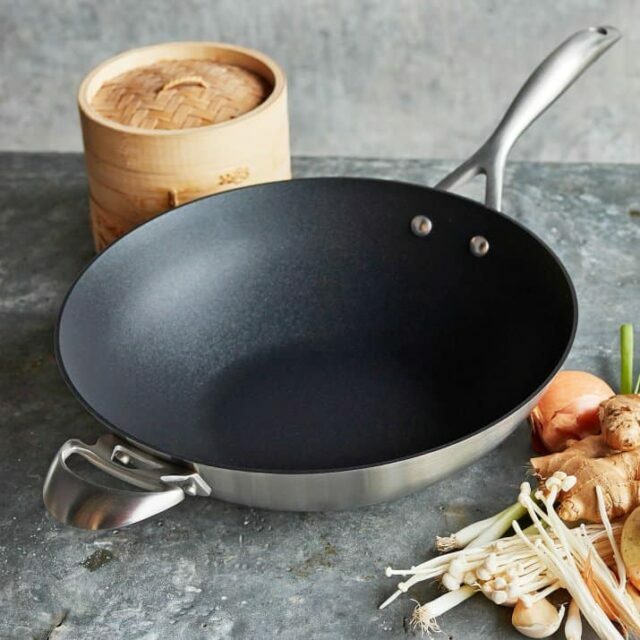 So, I’m always looking for woks with a flat bottom, like this Scanpan. PRO: The Scanpan CS+ Wok works perfectly. See how the flames lick up the sides of the wok? That’s good. The shape of a wok is important, too. If the flat bottom is too small and the wok curves too steep, the wok will not get enough heat. 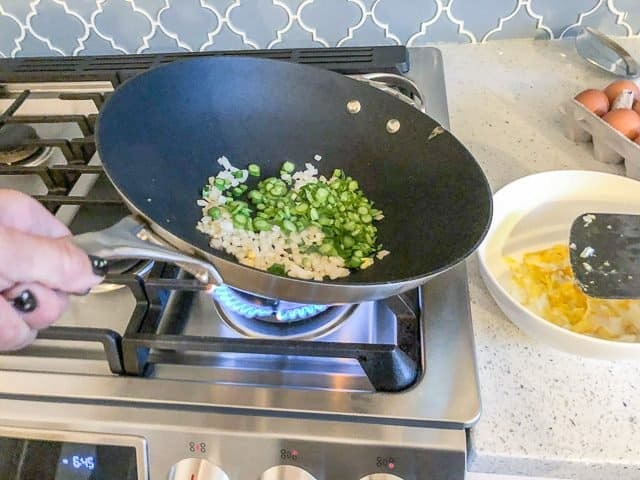 If the base’s flat bottom is too large, then it makes stir-frying difficult – imagine trying to stir fry in a saute pan. PRO: This wok has a nice graduated curve. The sides go up high enough so that ingredients don’t fall out during stir frying. 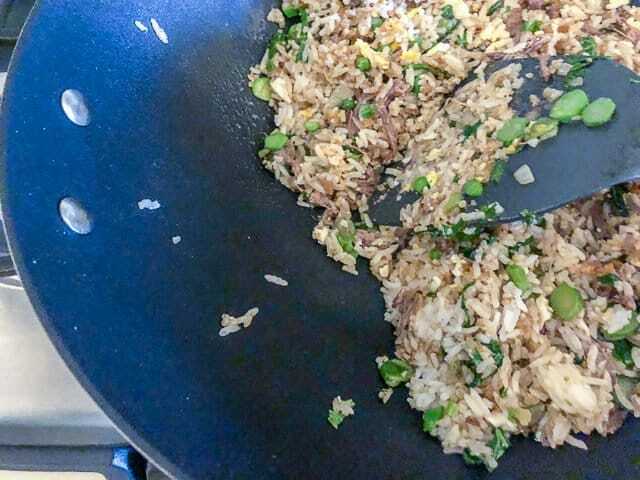 The reason for this cooking method: fried rice contains at least 5 different ingredients. 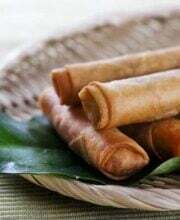 Each ingredient has different cooking times. 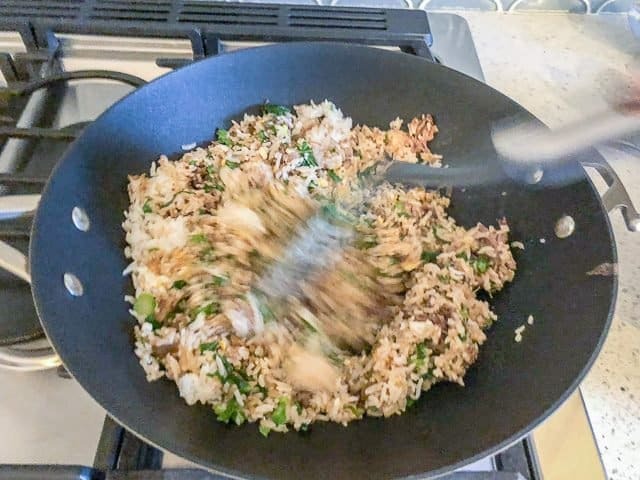 Cooking the ingredients separately ensures fluffy, light fried rice – not a goopy, soggy mess (which would happen if you dumped all ingredients into the wok all at once). Chinese sausage is cooked first, so that the delicious fat in the sausage renders. That savory-sweet fat becomes flavorful cooking oil for the rest of the ingredients. Eggs are cooked next, then removed. Onion and chopped asparagus stems are next, then scooped out. CON: The Scanpan wok is heavy. At a little over 4 pounds, it is too heavy to lift with just one hand. 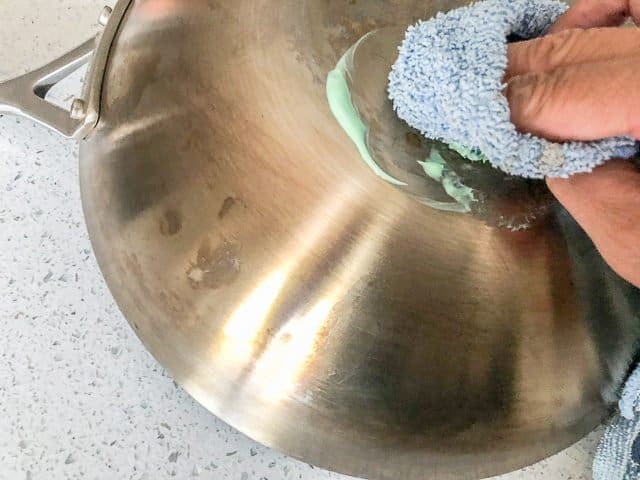 I have to tilt the wok, and use a spatula to scoop ingredients out….or I could use my other hand on the helper handle and “pour” the ingredients out, hoping not to spill. PRO: Love the shape of the wok, even with my crazy kung-fu stir fry action, none of the ingredients spilled out. PRO: Absolutely NO sticking. I used very little oil – just the fat from the Chinese sausage. Also, since no ingredients stuck, the Scanpan wok was simple to clean. PRO: Scanpan CS+Wok is made to be used with metal utensils. I’ve used metal tongs in the wok with no problem. 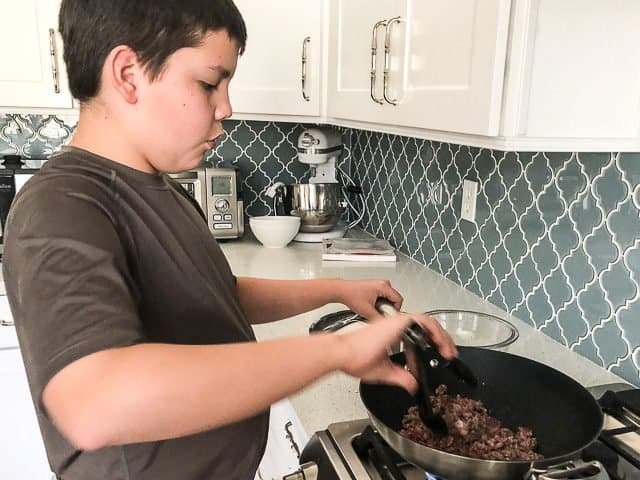 PRO: The wok does great job searing the meat, last week, Nathan made steak tacos with chopped sirloin. The steak browned beautifully in the wok. 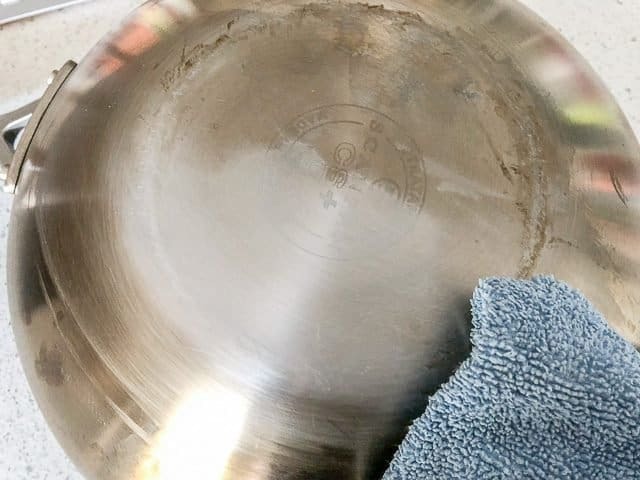 Like any stainless steel cookware, the outer layer discolors after use. How easy is it to clean? 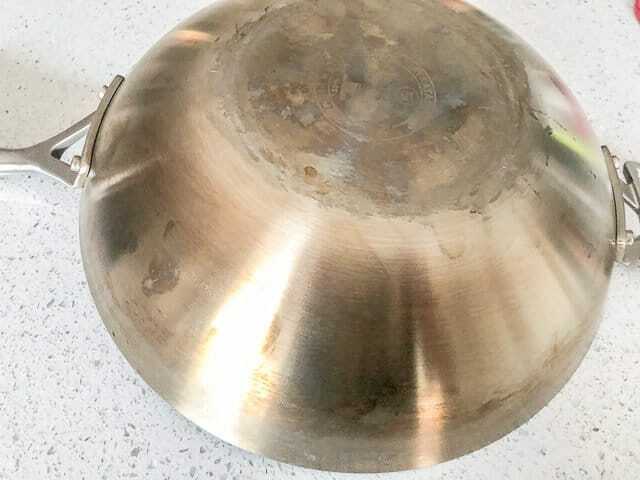 We used this wok every day for 3 weeks and only cleaned with soft side of the sponge and soapy water. My teenage kids are in charge of washing dishes, so I’m betting that they don’t even wash the outside of the pan, or dry with a towel. 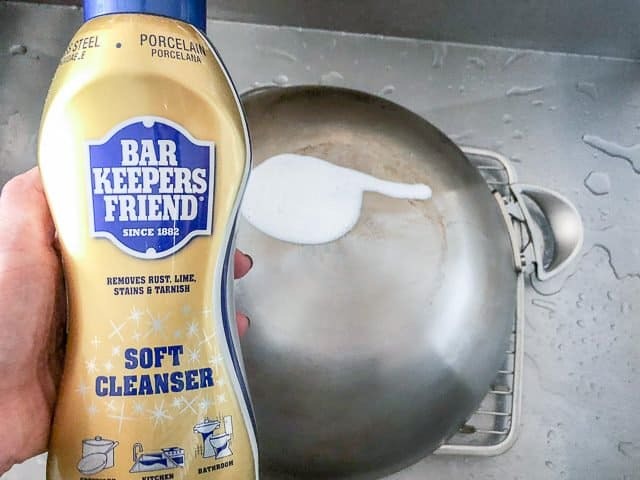 We put a little stainless steel cleaning paste on a soft microfiber towel. Just a soft towel and a little bit of pressure. It took a little time, but we got there. The other half, we used Bar Keepers Friend and the scrubby side of the sponge. CON: The most difficult parts to clean was the helper handle – the rivets, logo and 1/2″ tiny space above the handle. I just could not get that area clean. CON: Where’s the wok lid??? Woks need lids! Woks are used for more than just stir frying. A lid is needed for steaming, simmering, boiling, braising, sautéing. I had to go to Chinatown and buy a $10 lid for the wok. But it doesn’t fit perfectly, and looks so mismatched. Do I really want a nonstick wok? Easy to care for – my carbon-steel wok that required seasoning when I first got it is high maintenance. Over time, the seasoning made the wok “nonstick” but it took a lot of patience and care to get it that way. And you’ve seen how my teenage boys washed the Scanpan….I won’t let them touch my carbon-steel wok. I also have a light cast iron wok that requires care too. If there’s any drop of water left on that wok, it will rust. 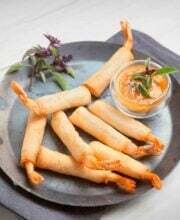 Easy to cook – ingredients don’t stick. Cooking is just easier. Especially when stir-frying – and ingredients come in and out of the wok within seconds. 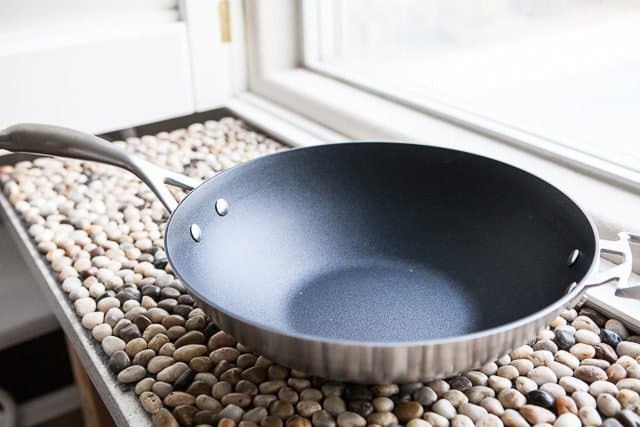 Less oil – I use about half the oil in this Scanpan wok. Scanpan says you don’t even need oil, but I prefer cooking with a little oil. So my answer is YES! But only a quality nonstick wok. The $20 cheap nonstick woks are garbage. They’ll only last a few months before the coating scratches off. 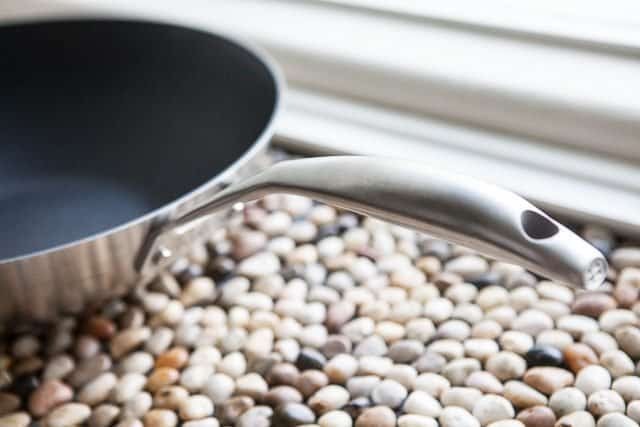 The Scanpan nonstick coating is commercial grade nonstick material and is directly bonded to the pan, so that it doesn’t scrape or peel away. 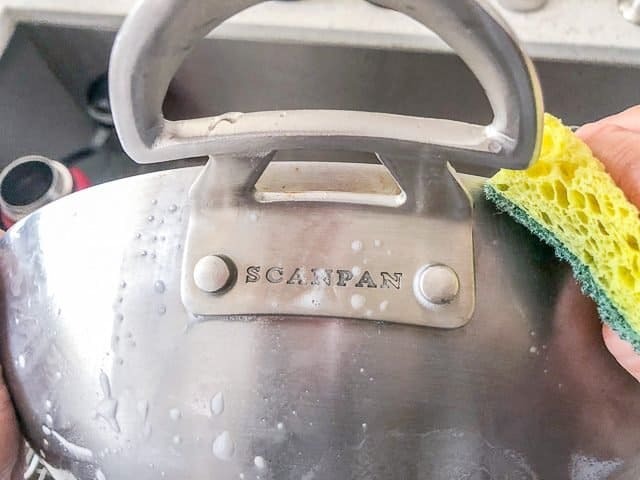 I’ve missed Scanpan in my kitchen. The pieces are heavy, durable and will last for many, many years. The nonstick coating is metal utensil friendly. It’s low-maintenance cookware that will perform. 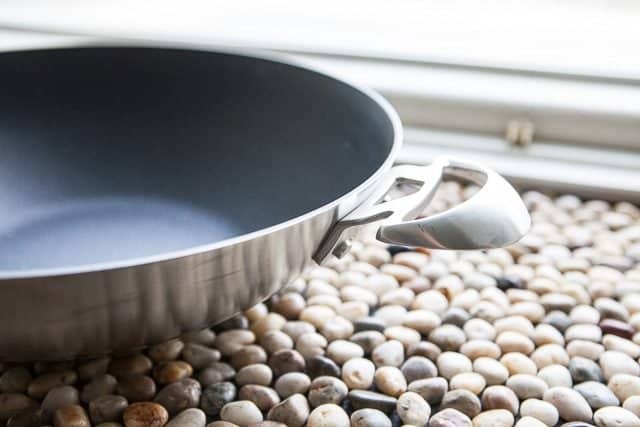 The Scanpan CS+ Wok is high end cookware, and costs $279 at Sur La Table.